As a fan of hand drawn mediums, I grew to distinguish things based on the style influence of the original creators. As anyone who might have read my other articles, I have a tendency to lean on a works character design. If there are large noses and ever morphing eyes, then I think of Osamu Tezuka. If there are pages after pages of children staring mouth agape drawn from one point of view, then I consider Kazuo Umezu. If everyone has large mouths, heavy eyelids, and are drawn in single lines strokes, then I must be looking at Natsume Ono’s work. But tonight, I will be talking about a work that purports my focus on character designs; as I review 2006’s Shoulder a Coffin Kuro. Shoulder A Coffin Kuro was created by Satoko Kiyuduki, who I recognize exclusively for her character designs (later I will go over her work in better detail). She is the mind behind the GA: Geijutsuka Art Design Class series, turning her use of 4-koma style and random color pages into a manga that teaches commonplace things done in an art class. 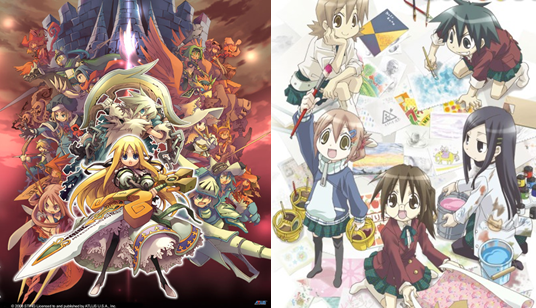 Satoko Kiyuduki might be known by some as the character designer for the Yggdra Union strategy games. 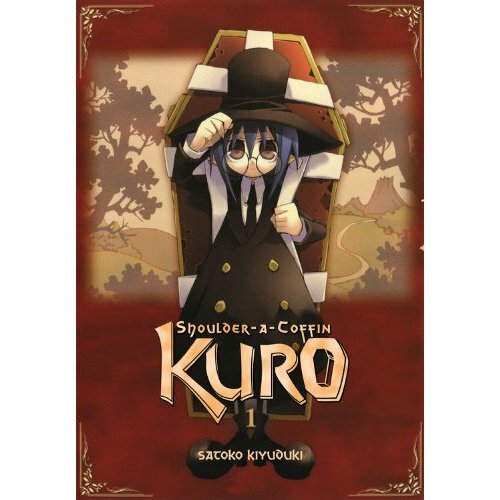 Shoulder A Coffin Kuro has a semi-linear plot, so describing it accurately might leave some confused. The story starts in medias res during a fictional medieval time (thing the fifteenth century but with a bike or plane showing up once in a while). An inn girl self-monologues on the three individuals buying hotel rooms, they include an older girl and two twin sisters. She tells the reader that her regular life was stilted by the appearance of the oldest girl (her given name is not revealed until later), who is wearing all black and carries a coffin behind her. Jumping to conclusions, she thinks that our lead is a vampire, staying terrified of what might be in the coffin. Night sets in and a bandit lurks around while everyone is asleep. But the inn girl, still worried about the new guests, is patrolling the halls with crosses and garlic. The bandit finds her and holds her captive. Suddenly, hundreds of bats show up and ambushes the bandit. We find out that the bats came from the women’s coffin, and that they are controlled by a talking bat that the girl calls Sen. When tomorrow comes, the girl says goodbye to the travelers with food as they walk out-of-town. That was Shoulder A Coffin Kuro’s prologue,with the next chapter going back to a time were our lead has not yet met the twin girls. A few stories go by where our lead and Sen goes from town to town looking for a witch, stopping to meet people who work as catalysts for the story, but continuing to travel on afterwards. At one point in her travels, she comes across an abandoned mansion. After breaking in, she looks through the house until she finds the two twin cat-girls locked up in a jail cell in the basement. Learning that these two are named Sanju and Nijuku and they are both experiments of the mansion’s owner who is called “The Professor” by the girls. Once seeing our lead, they start to call her “Kuro”, in account of her exclusively black clothes. Deciding to take them with her, Kuro is astonished to see that the girls can change form from cat-girls to a more mouse like size, allowing for them to slip through the bars. The story continues on like this with Kuro and company visiting new towns and fulfilling each of their own goals. I explained earlier that Satoko Kiyuduki has a familiar character design. Her characters are usually cute girls with round heads, even rounder dinner plate eyes, and almost nonexistent noses. Now, this time around she is able to branch out with much older characters like the old Fiber Baron with the Tezuka level nose. 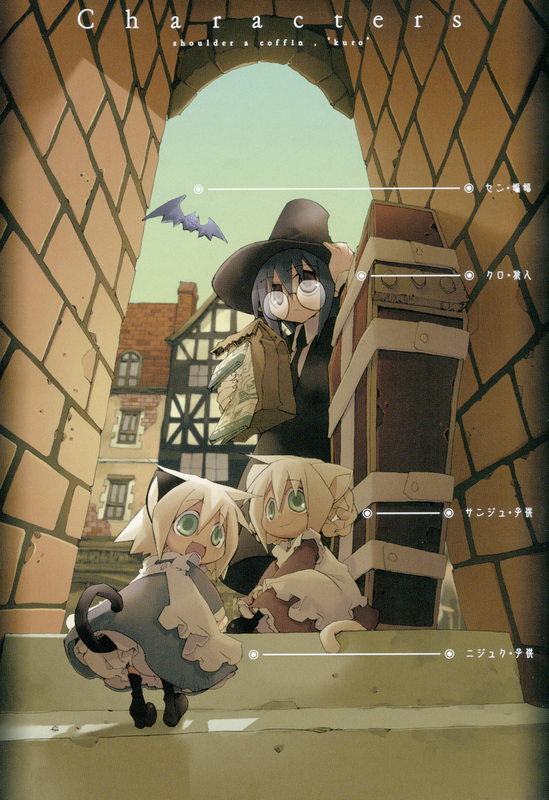 Shoulder A Coffin Kuro is laid out in the 4-koma format, were each page consists of a two vertical columns, with four panels each. This style is used more often in gag manga like Azumanga Daioh or Kiyuduki’s own GA:Geijutsuka Art Design Class. Kiyuduki’s work usually has many color pages throughout, which is where her art really shines. Her panels will be filled with inked shading that looks slightly faded and sets the will of the work with dark browns and greens. There is also a nice detail for evening settings. What is most impressive about this series is the mixture of the dialog and plot structure. Now, while the dialog is a little stilted at first, it has a tendency to reference the world it is in. For instance, Kuro references the sound of flying while in the forest to that of the plane owned by a pilot they had met chapters before. Kuro and company will occasionally see past acquaintances in new towns, as is often the case with the motorcycle riding traveler Kei. Kiyuduki put effort into keeping life into her fictional world. Pros: The color pages look vibrant and are able to color the work while being subdued. There is a feeling of lightheartedness that is capable of not being overblown by the cute character designs. It is able to show that there is much more going on then what is clearly shown. Side characters like the Fiber Baron and the dog faced traveler are charming window-dressings for the leads. Cons: There is countless plot points that are hinted at that really test on reader’s patience. People might be put off by how simple the artwork can be at times. It might be losing an entire market just because of the character designs. The story is filled with multiple concepts, but can be considered making up for its simple story. As my attempt to explain the plot exhibits, the story tends to jump around when it deems it necessary, leaving interesting things left behind. 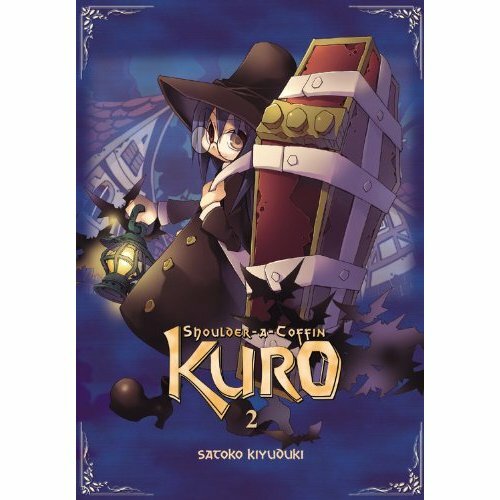 Shoulder a Coffin Kuro ran two volumes before it was canceled, so what Yen Press put out is all that was released. It’s a very nice release, with its meticulously printed black panels and thick pages, hindered only by an easily mangled cover (if VIZ Signature or DMP put this out with their dust jackets, I would have no room to stand on). I believe that while it does have its faults. It is a perfect example of “love it or hate it” entertainment; I do think that this is a manga to check out if only for the art.